The U.S. Postal Service and the National Postal Mail Handlers Union have reached a new agreement to send off more employees. 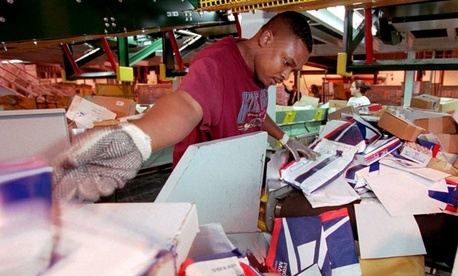 The deal, announced Thursday, offers voluntary early retirement opportunities to 45,000 bargaining mail handlers, according to USPS spokesman Mark Saunders. All career employee mail handlers will be eligible for the incentives. Full-time employees will receive $15,000, while part-time employees will receive prorated amounts if they accept the offer, Saunders said. Employees who meet certain requirements will be eligible for the same deal, but under early retirement rather than buyout terms. NPMHU places the total number of employees it represents at 47,000, but USPS says that figure includes 2,000 casual employees who happen to perform mail handler jobs; they will not be offered buyouts because they are not career employees. Mail handlers "load, unload, prepare, sort and containerize mail for delivery,” the union explained. Calls to NPMHU for comment were not returned. Both parties signed a memorandum of understanding Tuesday. Employees must notify USPS of their intent to separate by July 2 (or July 16 for part-time employees), and must separate by Aug. 31. The incentive payment will be distributed in two increments of $7,500, minus withholdings and required deductions, with the first payout arriving on or around Dec. 21, 2012, and the second arriving on or around Dec. 20, 2013. The payout for part-time mail handlers will be based on the number of hours the employee worked the previous year, Saunders said. Those who worked less than 520 hours will receive 25 percent of the buyout; between 520 hours and less than 1,020 hours will receive 50 percent; between 1,020 hours and less than 1,520 hours will receive 75 percent; and more than 1,520 hours worked will receive the full payout, even though USPS classifies a full year of work as 2,080 hours. There are eligibility exceptions. Buyouts will not be offered to mail handlers in probationary status, those who have received notice of removal, those who are leaving under disability or those who are transferring to another federal agency, he said. Though these buyouts will result in a reduced mail handler workforce just before the 2012 election mailings season begins, Saunders said customer service would not be affected by the cuts, adding USPS has had a pay freeze in place for several years in anticipation. “We’re very cognizant of the need to have the right staffing in place at the right time and this initiative is part of that strategy,” he said.